Salvaggio said one of the men grabbed the shark by its tail while the others wrapped it in a wet blanket, went into a back room, put the shark in a bucket and put the bucket in the stroller. 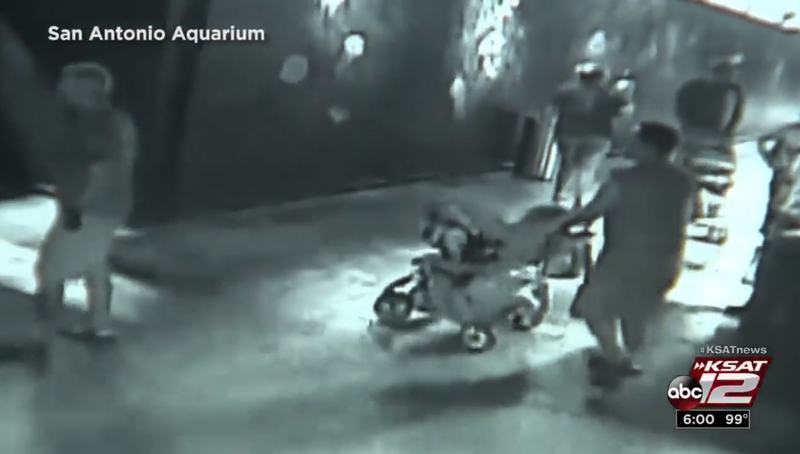 According to Jenny Spellman, the general manager of the San Antonio Aquarium, an employee noticed what was going on and immediately notified management. ... Spellman said the group attempted to pass the shark off as a baby. The man in the truck peeled it with his fake shark baby, leaving his now-sharkless compatriots behind. The truck has since been impounded. Per NBC 5, police eventually tracked the shark down to “a man’s home, where it was being well cared for,” and it has been returned to the aquarium. Unfortunately, said shark was loaded into a bucket that contained a bleach solution, per aquarium personnel. Salvaggio told reporters “We’ll be surprised if the shark survives” after its ordeal outside the tank, KSAT 12 added. The horn shark in question was about 16 inches long. Aquarium owner Ammon Covino told BuzzFeed News the species’ horns are sharp enough that “if you were to step on them you would get gouged,” and they will “absolutely” bite humans who try to mess with them. Curiously, the IUCN Red List defines the species as relatively abundant and of “no commercial value” off the coasts of California, so this is not at all like stealing a rare tiger or something. If the thieves intended to steal the shark for resale or simply save a few bucks on their home aquarium, searches for the species in question on various aquarium suppliers’ websites and eBay generally returned prices in the $300-400 range, which really doesn’t seem worth quite this much effort. But hey, who the hell knows what was going on here, really? As of the date of the theft, it was Shark Week.